Outlandish Observations: Jamie in my living room! Lucky! I thought about asking if I could take the one at our B&N but I didn't. Should have. I too won at our B&N. I got the updated Companion, the DVDs, and the poster from the second half of the season. I already have the BluRays so I'm thinking of giving them away on the Outlander Watch Blog or Facebook page. I had a blast. Our group was also rather small but we spent about 4 hours just chatting about the books and the show and other authors we like. So much fun. HI - our group was also small; however, we shared emails and may try to meet in future. 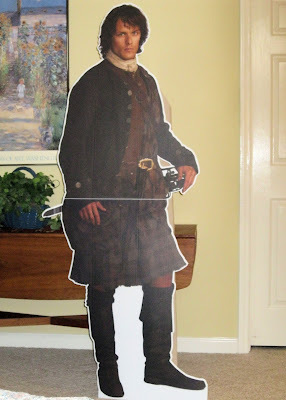 One of our party is part of Outlander UK; she has photos of herself with Sam, Catriona, et al. Great fun. Our raffle was a copy of OC1 and the DVD. We also now have Diana's curry recipe. you love the soundtrack! Bear McCreary is very talented as we all know. Hope you enjoy it as much as I do!